Cats come in all shapes and sizes, but there are certain breeds that are bigger or smaller than most. Have a gander at this big and small kitties and have a pawsome weekend. Thank Bastet it’s Friday. To end the week, I’ve selected two interesting videos for your viewing enjoyment. The first features cats with unusual fur patterns. These cats are truly unique, but aren’t all felines? The second film shows cats sleeping in unusual positions. However, no position is unusual for a cat. Have a pawsome weekend, everyone. I just discovered I have a royal guest today. What is your name and your author’s name, your highness? I am his royal majesty, King Henry. I was created by Anne Willow to help solve the mysteries she writes. She would be lost without me. What book(s) have you appeared in, your Majesty? Please list them and their genre. So far, I’ve appeared in Broken Promises (cozy mystery). It’s the first book in Anne’s new series, though she’s currently working on her second book. Concatulations! Tell us more about this series. It’s the Past Imperfect Mystery series. Julia is my human. She runs the antique shop in the small artist town of Grand Marais. It’s on the northwestern shore of Lake Superior. It was quiet until she arrived, but I was without a home then too. Julia has a special gift that she’s just learning about. She needs me to help understand it. Anne knew a cat once, a large, homeless, orange tabby who found her doorstep. He looked like he’d had a rough time, with a damaged ear and a few scars. It was late fall, and the nights can get cold on the North Shore. She invited him in to her home and heart. He was only with her a short time before he crossed the rainbow bridge, but she immortalized him in me. He left big paws to fill, but I won’t let her down. Awww. I’m sure you’ll do the job. A king cat must have very large paws. Henry looked up from his dinner. He dismissed her last statement with a knowing expression. “Alright, your Majesty. If you know so much, why don’t’ you explain it to me.” Julia challenged. Henry meowed again, this time sounding a bit frustrated. “Forgive me for not understanding cat. Go back to your meal, then.” Julia shook her head before going back out to the deck. Taking her spot again, she grabbed the notebook off the side table. “One problem at a time. I need to figure out who broke into the shop and killed Tom Peterson. Aunt Sadie’s letter will have to wait.” She flipped through the notes she already made and jotted down the questions plaguing her mind. Julia sketched out a flow chart to see who and what connected. “Nothing was disturbed, other than the lamp. Whoever came in knew what they were looking for, but who knew the letter opener existed and where to find it?” Only two names connected to the letter opener. Julia checked everything again, it all came back to those two names. Wow, Meow. You’ve tickled my fancy. I like that I’m there for Julia, anytime she needs me. I listen when she puzzles a problem out and help, in my own way. She still has one more gift to learn about and that’s where I’ll really be able to help her. For now, I just meow, but soon, like Julia, you’ll be able to hear my thoughts. It’ll take her a bit of time to figure it out, but until then, I’ll keeping talking to her in my own way. I agree completely. Cats are wiser than any human, real or character. Anne is working on her next book, but health problems have slowed things down. This book will bring in more about her life before Grand Marais, while solving a murder involving stolen antiquities. It takes place right after the end of Broken Promises. It should be out by the end of February. The third book in the series will take us far away, but that’s a secret. You’ll discover more about Aunt Sadie and solve a mystery started 70 years earlier. That is expected to come out in late spring. Sorry to hear your author’s been ill, but please keep us posted about the new books. I highly recommend you giving your author a paw with promotion. Best whiskers to both of you on your upcoming books. It was an honor cat chatting with you, Your Majesty. As promised after my interview with Paw, the dog from Sandra Baublitz’ Dog Detective mysteries, I had the pleasure to interview two of the author’s real life cats. Meow there, kitties. What are your names. Hi, I’m Socky, Sandra’s black and white tuxedo male cat. And I’m Miss Kitty her all black female cat. 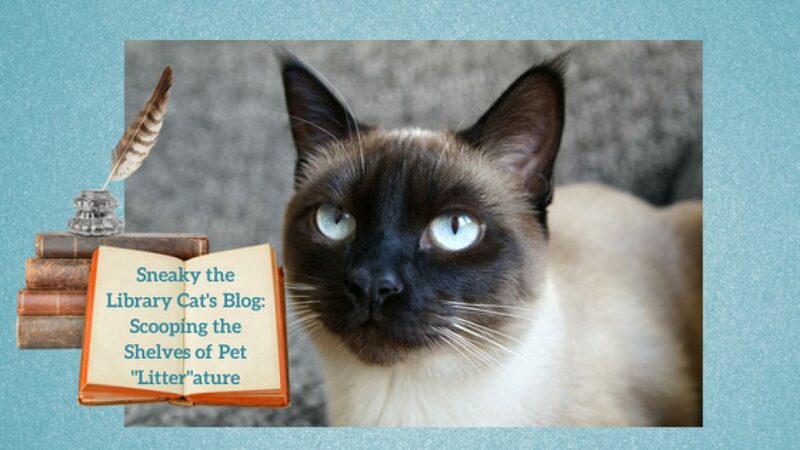 We’re author Sandra Baublitz’s pets. She writes the Dog Detective Series cozy mysteries. Miss Kitty: We don’t appear in any of her books as ourselves. Miss Kitty: Socky’s grumpy because a black cat will be in our owner’s next book. Don’t worry, Socky. I’m sure your author will base one of her characters on you, too, one day. Do either of you influence your author’s writing? Miss Kitty: Yes. We are very supportive of our owner. Socky: I sit in her lap as she types and purr to her. Miss Kitty: I sneak peeks of her work at night and we both whisper advice in her ear as she sleeps. Socky: So that’s how you got in the book. Miss Kitty: Hush. (Nudges Socky) You were an influence on Kathleen the cat’s character in the Missing Actor. Socky: Let’s just say that some of the mischief the cats in the books cause are from actual events. I think that’s pawsome. Although my author created me in the image of her Siamese Oliver who passed away two months ago, I have my own purrsonality. How do you feel about your author choosing a dog as her main character in her dog mysteries? Miss Kitty: To be fair, our author didn’t own cats when she started. She owned a dog. Socky: If she wants a dog in our life, I have to say Paw is the best option. That’s how I feel about Fido, my dog co-star. Debbie never had a golden retriever, but she did have poodles and a German shepherd when she was younger. I kept a tight grasp on Paw’s leash. Several birds flew up out of the field, but my real concern was more rabbits. Paw loved to chase them. We were getting close to the older homes when we heard a rustling in a nearby bush. Paw instantly went alert. We watched as a furry head poked out. It looked at us and then stepped out toward us. The cat was a mix of gray and black with long hair and tufts on her ears. Bits of grass stuck to her fur. Her tail was erect indicating she was happy to see us. She meowed plaintively to us. I was so startled when Paw lunged at her I lost my grip on his leash. He immediately ran at Kathleen. She turned and ran back to the houses with Paw in hot pursuit. I ran after Paw with Shelbee close behind me. We were both yelling for Paw to stop. Shelbee soon passed me since she had much longer legs. I was huffing and puffing as I exited the field and came out behind the older homes. I was just in time to see Kathleen slip through a cat door in one of the older homes. Paw ran full out into the door. He bounced off and shook himself. Shelbee was soon there on her hands and knees talking to Kathleen through the door. She had to keep pushing Paw out of the way. I approached more slowly to catch my breath. As I did, I noticed the house appeared to be unoccupied. There were no curtains at the windows or lights on in the house. No outdoor furniture and the grass looked like it needed to be mowed. The cat door was set in what appeared to be a small door to the garage. “She isn’t coming out,” Shelbee said to me as I got to the door. We could hear her meowing plaintively. It sounded as if she was scolding us. Paw kept jumping up at the door to look in, but someone had covered the window in the door with black plastic. Shelbee tried this and Kathleen stepped cautiously out. Paw was surprisingly quiet. But when Shelbee reached to pick her up, Kathleen slipped back inside. Paw started barking as well. “I get the feeling they want us to go inside,” Shelbee said, looking up at me. I nodded in agreement. We’re proud to have convinced her to add cats to her books. Neither of us are fans of dogs. And everyone knows that cats are more intelligent. Do the cats in your author’s books talk or are they silent like I am and just meow occasionally? The cats we inspired meow. They don’t talk. It might scare the humans. Good point. Humans can be scaredy cats especially when they are featured in mysteries. What advice would you give cat characters? Cause as much mischief as you can and scratch the killer. Better yet, jump on the villain’s head and back. MOL (Meow Out Loud). I like how you think. Book 2 in the Dog Detective Series is planned for March. We’ll do our best to help our author finish it. It’s set at a Bed and Breakfast. A murder mystery game is planned, but one of the guests dies before the game begins. Two cats join Paw, our author’s Saint Bernard character. Miss Kitty: I’m the inspiration for Saber. (She preens). Miss Kitty: Just ignore him. Paw filled me in on that book. It sounds pawsome. Our author is on Facebook and Twitter. Socky: I’m on her personal Facebook page profile photo. Miss Kitty (under her breath) Ham. And we both show up on her social media now and then. You should purrsuade Sandra to give you a blog, too. Just a thought. In the meantime, best whiskers to you and your author and thanks for cat chatting with me today. There are a lot of cat lovers in the world because who wouldn’t love a cat? But there are a few people who take this fascination with felines to an extreme. Here are some videos dedicated to Cat Ladies. There’s also a film about a man who’s added some awesome additions to his home for rescue cats.